Newman Ivey White Professor of Literature at Duke University, V.Y. 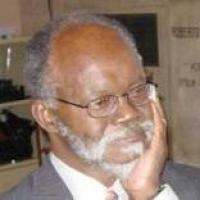 Mudimbe received his Doctorat en Philosophie et Lettres from the Catholic University of Louvain in 1970. In 1997, he became Doctor Honoris Causa at Université Paris VII Diderot, and in 2006, became Doctor Honoris Causa at Katholieke Universiteit Leuven. Before coming to Duke, he taught at the Universities of Louvain, Paris-Nanterre, Zaire, Stanford, and at Haverford College. Among his publications are three collections of poetry, four novels, as well as books in applied linguistics, philosophy, and social sciences. His most recent publications include: L'Odeur du père (1982), The Invention of Africa (1988), Parables and Fables (1991), The Idea of Africa (1994), and Tales of Faith (1997). He is the editor of The Surreptitious Speech (1992), Nations, Identities, Cultures (1997), Diaspora and Immigration (1999), and editor of a forthcoming encyclopedia on African religions and philosophy. He is also former General Secretary of SAPINA (the Society for African Philosophy in North America) and co-editor with Robert Bates and Jean O'Barr of Africa and the Disciplines (1993). Mudimbe, VY. África: pensamiento y controversias. Centro de Estudios de Asia y África, El Colegio de México, 2014 . Mudimbe, VY. "Au nom de la gratitude: une méditation." Entre inscriptions et prescriptions. V.Y. Mudimbe et l'engendrement de la parole (2013). Mudimbe, VY. "Coda: On the Practice of a Conference." Recontextualizing Self & Other Issues in Africa: The Practice of a Conference (2013): 235-252. Mudimbe, VY. "Afterword: A Meditation of the Convener." Contemporary African Cultural Productions/Productions culturelles africaines contemporaines (2013).